The Tracy was sunk in 1998 in 70 feet of water and lies upright. 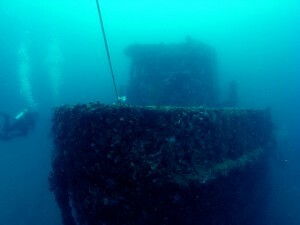 This wreck is very popular for wreck diving classes with easy penetration into the wreck. The Tracy is attached to the Jay Scutti by a cable and with a well planned dive it is possible to see both wrecks as the Jay Scutti is about 100′-150′ away. Ken Vitale was a well known instructor and on the wreck there is a plaque honoring this well liked local scuba diver.